I worked for many years as an organizer of Princeton’s Taste of the Nation, the hunger relief fundraiser, even chairing the event twice. I’m retired from the Committee now, but am still a big supporter – and they always need volunteers on the organizing committee, so step right up. As always, 100 percent of the ticket price goes to our beneficiaries, most of it to Mercer Street Friends Foodbank, Isles, HomeFront, and the Food Bank of South Jersey. 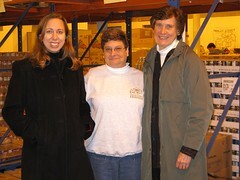 The photo above was taken at Mercer Street Friends, and includes (left to right) Lori Appelget, Taste Hunger Message Chair, Phyllis Stoolmacher, Foodbank director, and event Chair Joanne Meehan. This year’s Taste of the Nation is on April 20 at the Westin at Forrestal Village, 6:00pm. Incidentally, Taste of the Nation takes place all over the country each spring; it is a program of Share Our Strength, which leads the fight against childhood hunger in the U.S. This is a wonderful gourmet tasting event, with a live auction and amazing food and drink. Over 22 Princeton area restaurants and beverage companies will offer tastes of their specialties, with some notable additions to the lineup this year, thanks to some great new restaurants opening in central NJ (Due Mari! Elements! Eno Terra! And more!). Please check the website, which gets updated as new names are added. I hope to see you at this delicious and fun event. At the same time, you will be helping your local communities. Now more than ever, we need your support – one in four kids in the U.S. are at risk of hunger, and more families are visiting area pantries than ever before. Through the wonders of modern technology, I am able to pass along an insider’s discount to the Princeton event to you, my blog readers! With the discount, tickets are $75 instead of $85. To take advantage of this offer go to: www.tasteofthenation.org/princeton, and at checkout type in the following discount code: FAITH. This discount is only good until April 15. And do it soon, because they have sold out the last two years. After April 15, tickets are $85 online in advance, or $95 at the door, if available. You do so much good in our community. Yes, I know you’ll brush this aside as being ‘only natural’ or the like. It was a joy to hear your talk at Mary Jacobs Library this week on your Foodie’s Journey. For “Taste”, for Slow Foods, for gastronomy, for the simple sense of adventure all too absent these days – you hold the torch. Thank you!